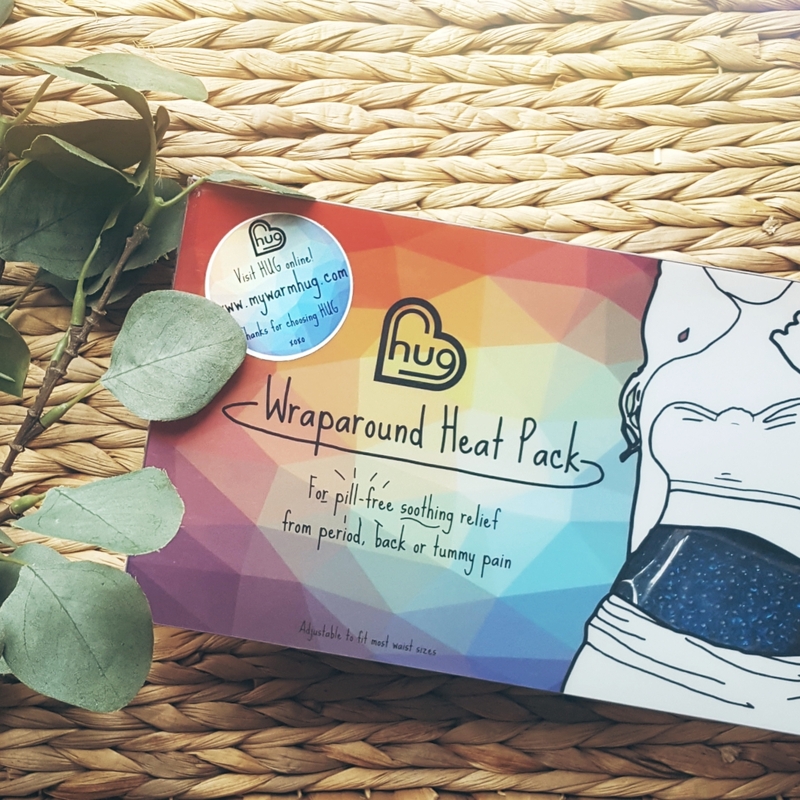 I was contacted a few months ago by the lovely Fiona over at Hug and asked if I would like to try one of their reusable heat packs. Now, you know me, I love anything that's even a smidgen like a hot water bottle, so of course, I jumped at the chance! Hug was created by product designer Fiona Bennington and is a wraparound, wearable heat pack that adjusts to different waist sizes. It is filled with pearls suspended in a gel liquid. You can wear Hug directly against the skin as it has a velvet lining that doesn't stick. It is discreet, practical and doesn't feel heavy to wear. ... But, it can also be used to simply keep you cool on hot days, or warm on cold days! Hug can be used warm or cold. For a cooling sensation, simply pop your Hug in the freezer for an hour. For a warm Hug, simply microwave as shown in the video and diagram below. There isn't any other way of heating Hug - please be aware of this if you don't own a microwave! Hugs temperature is dependent on you. However, there is a warning indicator on the heat pack which changes colour at 45°C and personally, I wouldn't heat it anymore than the recommended amount. Plus, you can heat it again as soon as it has cooled. You can see the range of ways Hug can be worn, here. Hug adjusts to different waist sizes with easy to use velcro straps. It fits from an 80cm waist up to 111cm which is similar to a UK ladies size 8 up to a size 20. Hug also offer a reduction strap for sizes below 80cm, and an extension strap for sizes beyond 111cm - both of which can be purchased separately to the heat pack. The video below will show you how to wear and adjust your Hug. Why should I try Hug? Low level heat therapy has been proven more effective as pain relief than over the counter pain killers, and much better for your body too! Where can I get a Hug? You can purchase the heat pack, accessories and gift packs from Hug's online store, where, currently, they are including a free gift with every purchase if you shop with them directly. Alternatively, you can purchase the heat pack alone on Amazon. The Hug website also offers international (for outside of the EU and UK) shipping. You can find more information on Hug via their website or by visiting their Twitter or Facebook pages. Hug recently took home the first prize in the Engineering category at the Invent 2017 Awards so it's now an award winning product! The story of Hug was featured on BBC Radio Ulster on Tuesday 17th October 2017 which you can have a listen to here if you are in the UK - flick through to 15:55 if you don't want to listen to the whole show! Their story will also be featured on the BBC1 Made in Northern Ireland series on Monday 23rd October 2017 at 7.30pm. If you're in the UK, you can watch it on the BBC iPlayer - just find the episode (series 2/episode 4) under the 'Northern Ireland' category. Sounds good, doesn't it? Well, it is good! I love a hot water bottle or my beloved (electrical) heat pad, but they aren't practical if you are moving around or need to leave the house. Hug is the answer! It's wearable and fully adjustable so it won't fall off or hang loosely. It sits reasonably discreetly too, though, obviously, it will show if you are wearing a skin tight outfit - you could always wear it on top of your clothes though and show it off! I really love that it wraps right around you, meaning the pain is covered from all angles. This is great for endometriosis pain because, if you're anything like me, when my tummy hurts, my back hurts too (what doesn't hurt!?). I also loved the way it feels - the little pearls are really soothing and give almost a massage type effect. It's quite satisfying to fiddle with when it's cooled down too! Hug is fully reusable which means, once you've bought it, that's it! No running out when you need it. No not being able to get to shops to get some more. No more cost. I also liked that it has instructions printed directly on the heat pack, so, no trying to find loose instruction papers all the time! Having had a run in with a gel hot water bottle in the past from which I have a lovely scar on my leg from where the hot gel leaked out, I'm quite a stickler for when it comes to instructions for this type of product. The warning indicator on the heat pack made me feel reassured but, I have to say, the edges of Hug are really well sealed also. So, that's my opinion!... Would you like a chance of winning a Hug all for yourself? Head over to my Instagram and find out how!